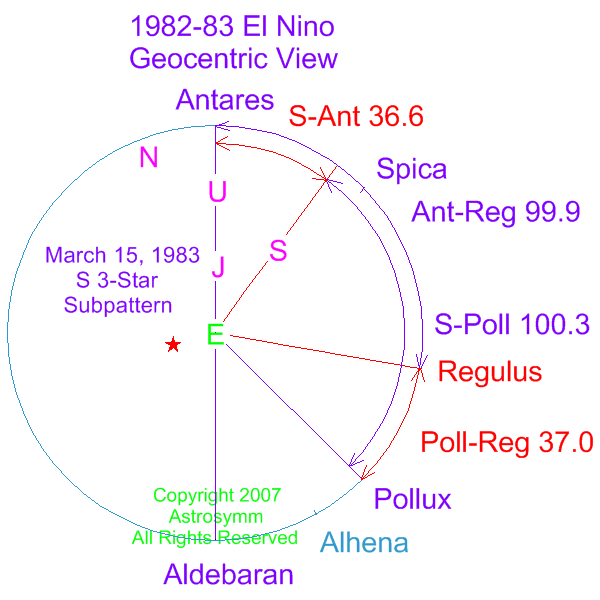 the following patterns are associated with el nino events..
this is a sun-centered, or heliocentric view, of the solar system. 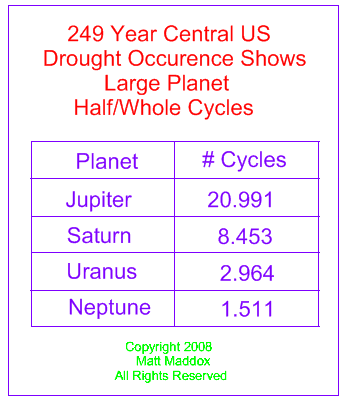 note the fairly long-term subpattern of saturn opposite uranus-regulus. this pattern can persist for several months because saturn goes through the sky about 1 degree per month. 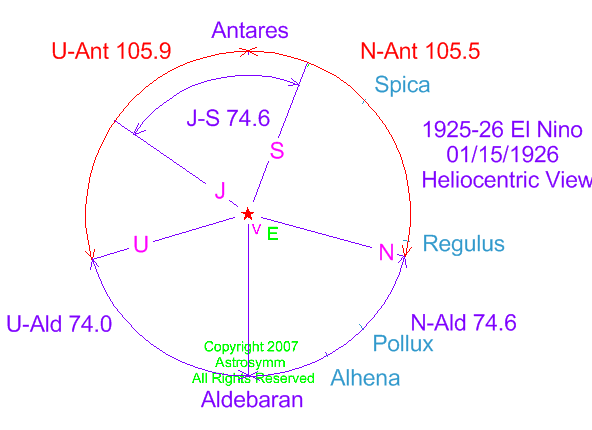 jupiter, neptune and alhena also compose a subpattern symmetric with the backbone of antares-aldebaran. 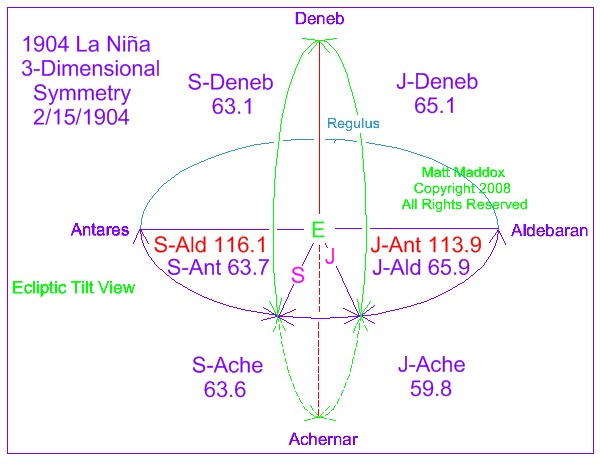 alhena-antares is a constant 148.6 degrees. neptune-antares on this date is 147.6 and jupiter-aldebaran is 146.8.
the reverse k pattern formed by jupiter and neptune would have been short-lived, since jupiter goes through the sky about 2.5 degrees per month. 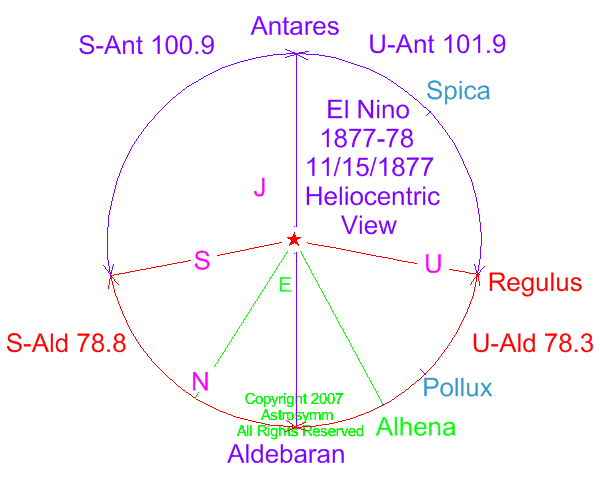 however, the “bird’s foot” subpattern composed of antares, alhena, aldebaran and neptune would have persisted well into this el nino episode. 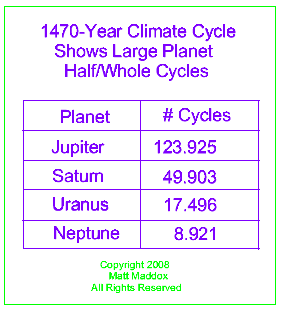 this is a sun-centered, or heliocentric view of the solar system. uranus and neptune form a long-term symmetric pattern with the stellar backbone composed of antares and aldebaran. temporarily, jupiter and saturn have the same angular separation. this is an earth-centered, or geocentric view of the solar system. 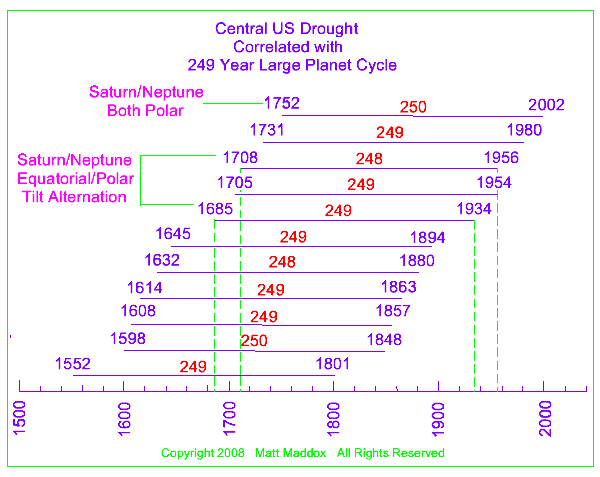 note the same large planet- 3-star subpattern is repeated within this extreme el nino event. 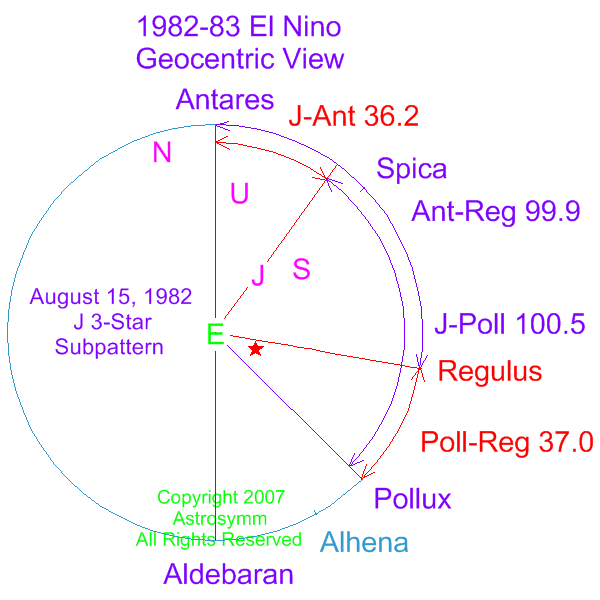 in august 1982, jupiter completes the subpattern. in march 1983, after some movement has occurred, it is now saturn’s turn to complete the subpattern. gerard bond et al., “a pervasive millennial-scale cycle in north atlantic holocene and glacial climates,” science, vol. 278, no. 5341, november 14, 1997, pages 1257–1266.